Today, I decided I would try to spot as many blue things as possible during my morning walk. There are a lot more blue things in my neighbourhood than I had ever previously noticed. Most of the time when I am walking, I set my mind on ‘nature’ mode and so automatically take in mostly browns and greens. Ah, the greens! But today, when I decided to start looking out for blue, blue objects started appearing. My eye was drawn to little details or faraway things simply by their virtue of being what I was looking for: blue. What we seek, we see (selectively so). When I look out for bad things, the negative aspects of a conversation, or of a day, fly to my attention, like iron filings to a Very Strong Magnet. Similarly, when I make it my business to see what’s interesting or positive in my environment, it is then I begin to notice those things popping up everywhere. They are sometimes tucked away inside tufts of grass; sometimes they masquerade as something else, perhaps functional and otherwise ignored. Nevertheless, what this morning exercise suggested to me is that good things have never been absent, except from my mind. And, that noticing good things doesn’t mean forcing myself to see positives-only-dangit, but instead noticing things just where they are, as they are. 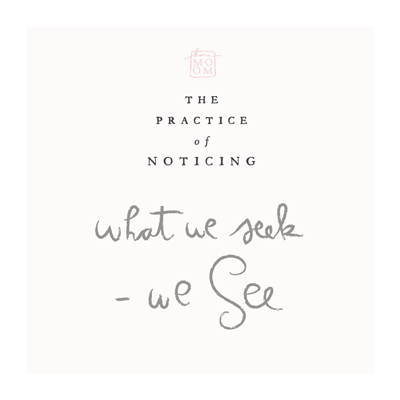 How can you practice the art of Noticing? Maybe you could pick a color and see how many times it shows up in your workplace or school. Or right when you wake up, try to pick out & describe 5 different things you can see or hear from where you are sitting. You might be surprised by what you Notice right where you are! That is so true........when I am determined to see His mighty handicraft, I can see it ! Thanks for reminding !